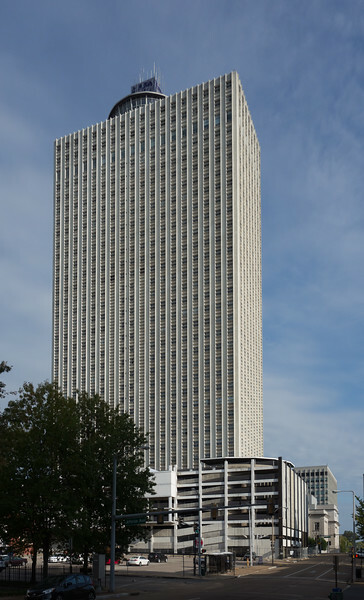 Built in 1965, 100 North Main is the tallest building in Memphis, Tennessee, standing at 430 feet with 37 floors. 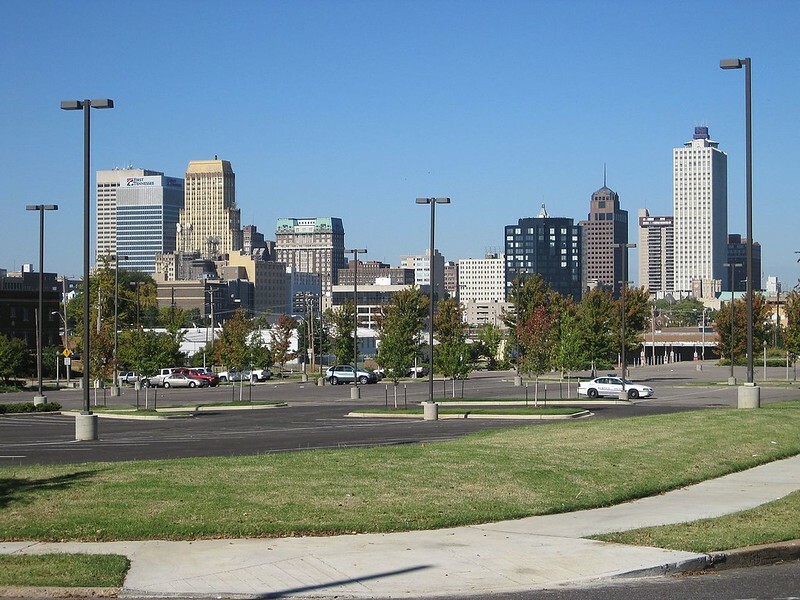 Since its construction, it has remained a focal point of the Memphis riverfront skyline. The building was designed by Robert Lee Hall, who also designed Memphis’ largest office building (based on square footage), Clark Tower, as well as Patterson Hall at the University of Memphis. 100 North Main is an almost identical, taller version of the 633 Building in downtown Milwaukee, Wisconsin. In their 1986 book, Memphis: An Architectural Guide, authors Eugene J. Johnson and Robert D. Russell Jr. called 100 North Main “one of the least interesting” downtown structures. For many years, 100 North Main was crowned with a large illuminated “UP Bank” sign, visible for miles. The sign was dismantled in late 2005 due to the acquisition of Union Planters National Bank by Regions Bank. The sign was never replaced and the tower’s top cap is a blue, empty box, giving the building a somewhat abandoned appearance. Because of the “UP Bank” sign, many Memphians mistakenly believed that 100 North Main was the headquarters building of Union Planters, although the bank’s actual headquarters was at 67 Madison Avenue and, later, 6200 Poplar Avenue. The building was constructed with a revolving restaurant atop the main roof. This restaurant operated under several different owners and names like the Top of the 100 Club and Pinnacle. Behind the restaurant was a Japanese garden which closed in 1971. A few large stones and a concrete path are all that remain of the garden today. The base of the tower is a multilevel parking garage with some retail space accessible from street-level entrances. Due to its proximity to various municipal buildings, 100 North Main’s tenant base consisted primarily of attorneys, title companies, and various other professionals involved with government business and the courts. In 2006, the aging office tower was priced for sale at $20 million. Due to limited demand for commercial office space in downtown Memphis, much office space began to decline in value. By January 2012, only 30% of the building was occupied. The building sold for $5 million in August 2013. In February 2014, the building’s new owners revealed plans to convert the building into apartments and a hotel at a cost of almost $100 million. The building was emptied of tenants in preparation for renovations to begin. Despite this, the owners weren’t able to secure financing for the project and sold the building in August 2015 for $5 million. The new owners plan to continue on into 171-room hotel and 254 apartments. 100 North Main was listed on the National Register of Historic Places in 2015 as an example of mid-century modern architecture.